Objectives of Seasoning of Timber. Methods of Seasoning of Timber. 1. Natural Seasoning of Timber. 2. Artificial Seasoning of Timber (Kiln). 3. Chemical Seasoning of Timber (Salt Seasoning). 4. Electrical Seasoning of Wood. By seasoning of timber, it is understood that the controlled reduction of moisture from the wood. This is necessary for reducing the unnecessary weight of timber, for effecting an increase in its strength, to improve its workability, to reduce the possibility of development of shrinkage defects and to ensure durability or long life of timber. The moisture content of standing trees may be as high as 40-60 percent or even more. After careful seasoning, it could be brought down to 4-6 percent by (kiln seasoning) or 14-16 percent by (air seasoning). Two general methods of seasoning of timber as applied today are air seasoning and Kiln seasoning. In air seasoning, timber in properly cut forms is stacked in a proper manner in the open air for losing moisture by process of evaporation. The Stacks are so constructed to allow free circulation of air around each part as far as possible. The stacks are properly sheltered from direct sun and winds and rain. It may take 6 months to 4 years for bringing down the original moisture content to allowable limits of 14-16 percent by this method. Some times logs are placed in running water before subjecting to air seasoning. This helps in replacement of “sap” from wood cells by water. The water-saturated wood dried quicker as compared to sap-rich wood. The process of placing timber logs in water is sometimes referred to water-seasoning. In kiln seasoning, timber is dried for specific periods and under very controlled conditions of temperature and humidity in specially designed kilns. Tunnel type kilns can also be used for this purpose. Among the other methods of seasoning of timber and wood, the chemical seasoning and electric seasoning are of some importance. Timber can also be made fire proof to some extent by giving external coats and treatment of fire retarding chemicals like sodium silicate, sodium arsenate or borax. Left to itself, wood gets damaged slowly compared to steel in a house on fire. As already said trees contain a lot of moisture in the standing condition. The mode of occurrence of water in wood issue is rather complex and must be understood thoroughly. It is because a number of important properties of wood and timber depend on its moisture content and the way in which it is present in the wood. The wood tissue stores water in cell walls and the cell cavities. (a) The water present in the cell walls is called the bound water, the hygroscopic water or the imbibed water. It is this water, loss or gain of which will affect the dimensional stability of the timber. It makes 25-30 percent of the dry weight of the wood tissue when all the cell walls are fully saturated with water. This situation, in which all the cell walls of wood are fully saturated with water (and the cavities are empty) is termed as fiber saturation point. (b) The water present in the cell cavities of the wood tissue is called the free water. Its presence effects the mechanical properties of the timber. If the total moisture content in a species of timber is 75 percent, and its fiber saturation point is 30 percent, then, the free water is 45 percent. 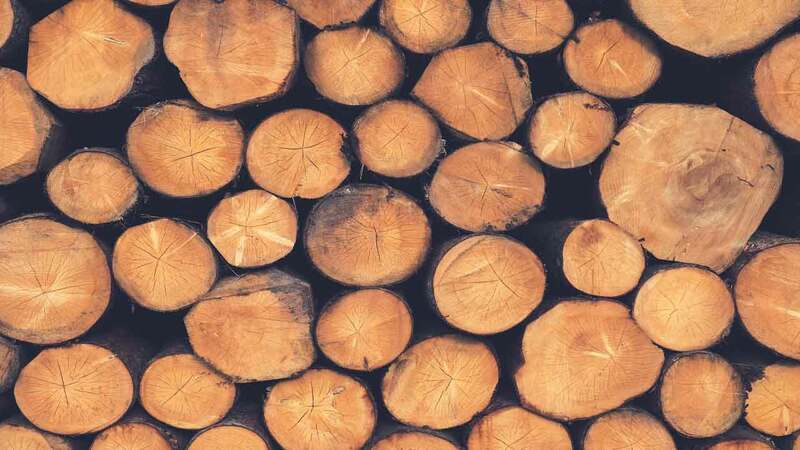 Whenever a freshly cut wood log is laid for drying, it is the free water (from the cell cavities) that is lost first. Once cell cavities are empty, and drying is continued, then the water from the cell walls will start moving out due to drying effect. And it is only the loss of water from the cell walls that will cause shrinkage in the wood. Similarly, if a dry piece of wood is left out in a humid atmosphere, wood will start absorbing moisture. (Because, as already said, wood is a hygroscopic material). Supposing the original moisture content of the dry wood is only 6 percent and the humidity of the atmosphere is 40 percent, then the wood will go on absorbing moisture till its moisture content is the same as that of the atmosphere in which it is exposed. This is called the “equilibrium moisture content” of the wood. When water is absorbed by the wood, it is the cell walls that must be saturated before the cell cavities are allowed to get any water. This is the reason doors and windows made of wood show swelling effect during rainy seasons immediately after a few days of rains, especially when they are located where rain water can fall directly on them. 5. Increases the life of timber, i.e. makes it more durable. This is as yet the most common process of seasoning of timber used throughout the world. In this process, timber sleepers, planks, etc., cut from the wood logs are stacked in the open air. (a) Stock ground: It should be level, free from debris and on dry land. It may be a few “cm” below the ground level. (b) Stack Pillars: These are constructed at regular intervals out of bricks or masonry or concrete and may be of 50 cm height from the ground level. Their top surfaces should be flat and level with each other. (c) Stack Proper. These are made of sawn timber shapes (sleepers, planks). One stack should have timber of one shape and same length and width. enough space is left between one stack and another stack. The stack length and height depend upon the length of the wood part being seasoned. A single stack may be 3 to 4 meters in height. The most essential consideration in making such a stack is ensuring free circulation of air around each part of the wood placed in a stack. It is also essential that the stack should be safe from direct winds and direct scorching heat. This is because, in air seasoning of timber, the loss of water is due to evaporation. The rate of evaporation will depend to a great extent on the atmospheric conditions. Efforts should be made to maintain a uniform rate of evaporation. Scorching heat and strong winds can cause excessive evaporation that may lead to the development of shrinkage cracks. The seasoning stack should also be protected from rains because wood being hygroscopic material can absorb moisture quickly. Outline of Stacking Arrangement: The time taken for air seasoning of timber depends on climatic conditions and thickness of the timber. It may take 1-4 years to bring down the moisture content to 16-17 percent level. It is applicable to thicker timber parts as well as a thin section. It keeps the valuable land and timber blocked for longer periods (and hence in some cases may be uneconomical). Moisture content cannot be brought below a certain limit (16-17 percent). Seasoning is not always uniform in all the sections of timber. This is a process of natural seasoning of timber that gives good results with logs of freshly cut trees. When the logs are placed in running water, the sap from the cells can be easily washed out. In place of sap, the cells get filled with ordinary water. When such logs are taken out, and wood from them placed for air seasoning, it takes comparatively less time to become dry. The timber logs can also be placed in stagnant water if running water is not available nearby. In such a case, the water should be replaced every week. Placing the logs in water also saves them from unequal shrinkage (at the cut ends and along the length) if left for more time in the open without sawing into smaller pieces. Hence it is a useful process in two ways. This is the modern method of seasoning any type of timber in a short time. It involves drying the timber in a specially designed kiln where there is perfect control over temperature, humidity and air circulation. With the help of kiln seasoning of timber, it is possible to reduce the moisture content to as low level as 6 percent. (a) Timber is stacked properly in the kiln keeping open spaces for air circulation. The kiln is then heated to low initial temperatures, only slightly higher than the atmospheric temperature outside. It is kept at that temperature for some time. This initial low heat is essential to avoid cracking or splitting of timber which would become certain if the temperature is suddenly raised to high drying rates. In that case, moisture from the surface of the wood will dry out fast (causing shrinkage) whereas moisture in deeper cells will be slow in moving out. In slow heating, this risk is adequately covered. (b) Once the timber has been at low heat and good humidity for some time, the temperature of the kiln is raised. Humidity is reduced, and air circulation is made faster. In this way a continuous process of loss of moisture from the deeper cells to the outer cells of the timber and from there to ‘outside’ the kiln starts. (c) During the heating process, all efforts are made to maintain a uniform circulation of the air so that all the parts of timber in a pile receive the same amount of heat. This aspect is the most difficult one in kiln seasoning and requires expert handling for good quality seasoning. Many modifications of kilns for seasoning timber are available. it is a costly method, no doubt But the quality of seasoned timber is highly satisfactory. This may be grouped under processes of artificial seasoning. In this method, the timber piece to be seasoned is treated with a chemical solution like sodium chloride, sodium nitrate or urea. The essential quality of such a solution is that it reduces the vapor pressure on the surface of application. Once such a treated timber is exposed to natural drying, it is the water (sap) from the inner cells mat moves to outer cells at lower vapor pressure. The wood surface remains moist while moisture from the interior goes on diffusing to the exterior. In other words, chemical seasoning of wood enables the timber to dry first from inside. It is definitely an advantage as it prevents the risk of cracking of outer shell. It is of theoretical importance only. Dry wood is a non-conductor of electricity. But when a high alternating current is passed through a piece of green timber, heat generated is enough to dry out the moisture of the cells which do conduct some electricity. In this way, the timber pieces are dried quickly. The technique involves costly equipment, and even the consumption of electricity is so high that the process is uneconomical. Moreover, heating of cell walls causes considerable weakness in them. This is also a quick method of removing sap from within the cells. The timber to be seasoned is immersed in water, and the water is raised to boiling temperature. It is kept boiling for four to five hours. The sap is washed out by this process. On placing in the air, such boiled timber dries quickly. But, at the cost of the strength and elasticity of the fibers. Hence, this method is also rarely used. Read More: Preservation of Timber and Wood. Its Methods, Materials.